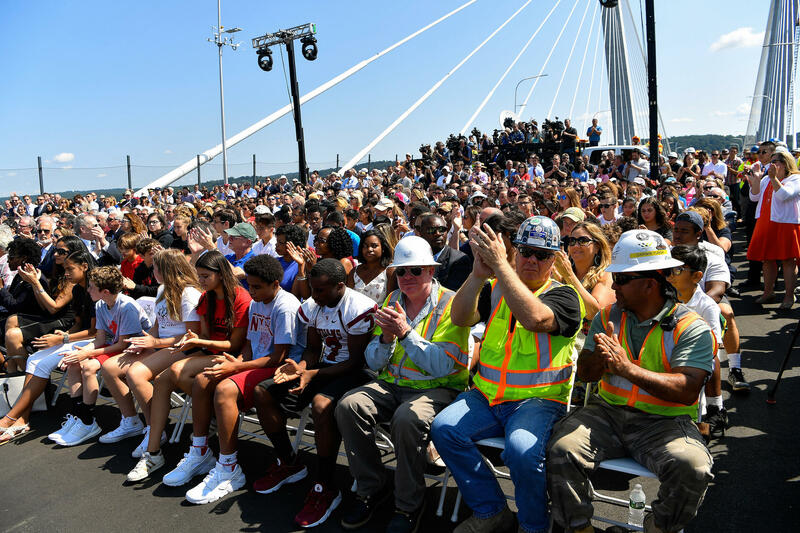 Governor Andrew M. Cuomo Thursday announced the opening of the first span of the Governor Mario M. Cuomo Bridge. Four lanes of Rockland-bound traffic will begin crossing the first span late Friday night into Saturday morning. 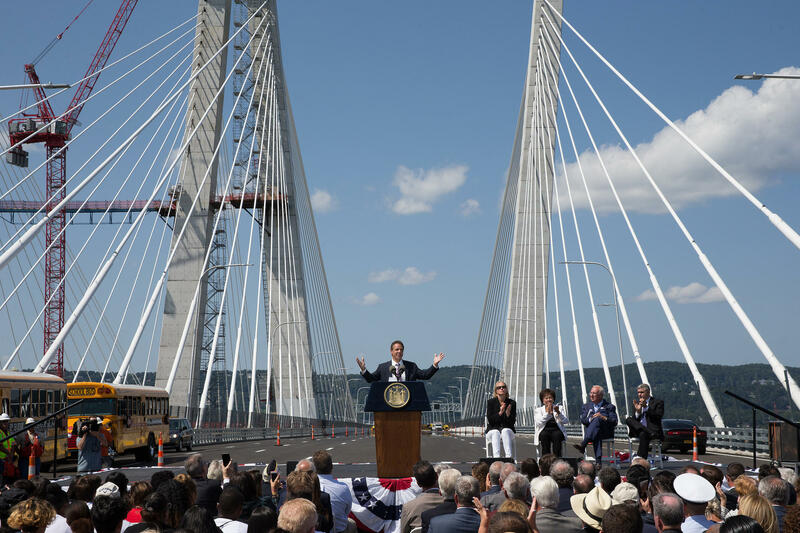 Governor Cuomo Thursday opened the first span of the new Thruway bridge over the Hudson River , known as the Tappan Zee Bridge and to be renamed the Governor Mario Cuomo bridge. But questions still linger over how, ultimately, the bridge will be paid for. Cuomo has been reluctant to divulge details on how the tolls on the Tappan Zee Bridge will be affected after the multi billion dollar project to replace the over three mile long bridge is completed. Part of the estimated $4 billion project has been financed through one time payments from banks, as part of settlements after the financial crisis. There’s a $1.6 billion federal loan, and the Thruway Authority has taken out around three quarters of a billion dollars in bonds. But a full financial plan has never been released by the Cuomo Administration, and it’s unclear whether new, higher tolls will be needed to pay for the rest of the bridge. The governor, at a business group breakfast July 27th was asked, by the leader of the state’s Republican Party, Ed Cox, how the bridge would ultimately be paid for, after that. 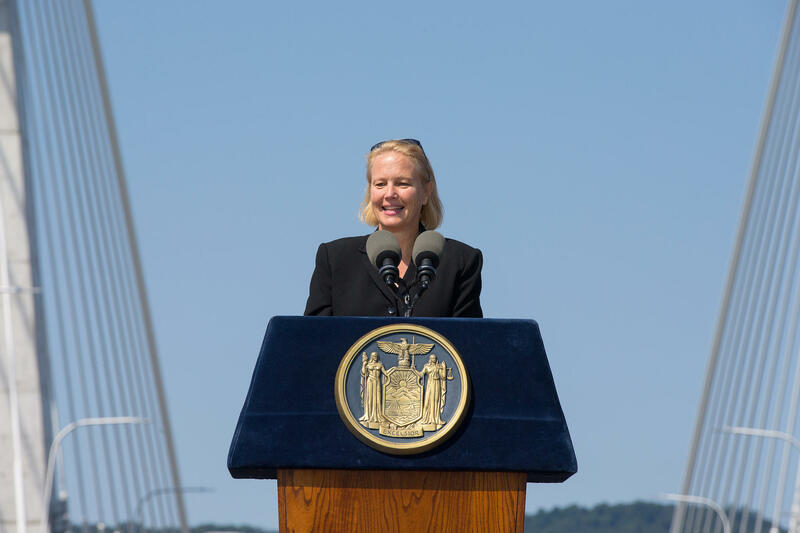 Onondaga County Executive Joanie Mahoney was also on hand in her role as chair of the NY Thruway Authority Board. “What is the final financing plan?” Cox asked. Cuomo, who seemed a bit caught off guard, answered that “the remainder after 2020 will be paid with toll revenue from the entire system”. The tolls on the bridge are frozen at $5 until 2020. The governor did not say whether or not they would increase after that. Cuomo’s comments caused a back lash. Western and Central New York Thruway users who seldom drive as far south as the Hudson River crossing into Westchester objected to potentially paying higher tolls. The business group Unshackle Upstate said at the time that it’s “unfair to ask upstate commuters to pay for a bridge that many will never use”. A ribbon-cutting ceremony featured more than 800 dignitaries and residents from Rockland and Westchester counties on the cable-stayed area of the first span. The construction project is one of the largest in the nation and the biggest in the history of the New York State Thruway Authority. On August 7th, Cuomo’s budget director Robert Mujica, wrote a letter to the Albany Times Union, after the paper editorialized against using having all Thruway users subsidize the bridge. Mujica said “no upstate tolls are necessary to build and operate the new bridge”. Earlier this week, Cuomo seemed to walk back the July comments, telling reporters in Rochester that Thruway users in other parts of the state won’t be playing for the bridge, after all. Cuomo says he see the bridge and the rest of the Thruway as “two discrete matters”. The governor says his earlier words were misconstrued, saying “the facts have been confused”. “You, know there are always shadows, and fears and conspiracies,” Cuomo said. Cuomo’s seeming reversal puzzled GOP Chair Cox, who called it a “flip flop”. Speaking on his cell phone, Cox says Cuomo should rightly be “proud” of his achievement in getting the bridge built, and in naming it for his late father, Mario Cuomo. But he says the governor does not seem to have “settled in his own mind”, how the remainder of the costs of the bridge will be paid for. “When a project is almost finished, you ought to know how it’s going to be financed,” said Cox. An aerial view of the new Mario M. Cuomo Bridge, facing east. Part of the new span on the left will open Friday. Both spans of the bridge are expected to be operational by June 15, 2018. 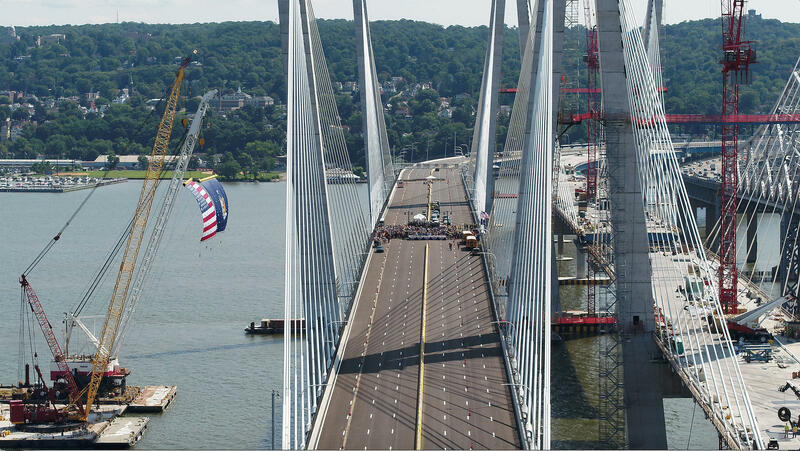 The 62-year-old Tappan Zee Bridge on the right edge of the frame will be torn down.